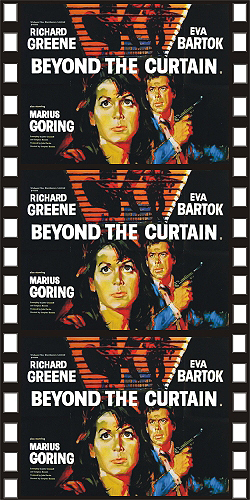 BEYOND THE CURTAIN (1960) Richard Greene, Eva Bartok, Marius Goring, Lucie Mannheim. An East German refugee finds herself back home in Dresden when the flight she is stewardess on is forced down there. She is then used by the police to find her wanted brother. But trouble and intrigue soon arise when her fiancé and colleague (Greene) arrives to bring her back to the west side of Berlin. A great cast and an engaging script help pull this one off. 35mm.